MLO for Android V2 beta testing begins! Great news! 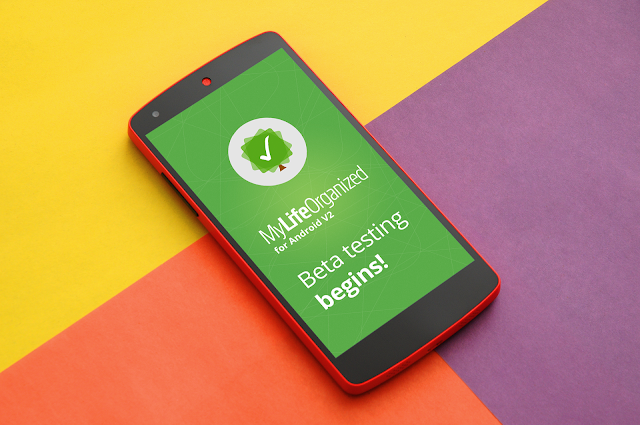 We announce that beta testing of MyLifeOrganized for Android V2 has officially started. More than 100 people from all over the world will keep track of their tasks in MyLifeOrganized beta version during the testing period. That’s how we can test our app on the real data and make sure MLO V2 is of the best possible quality. Testers can already enjoy modern UI of the app and brand new features! We have assembled experienced and reliable beta team, which is not yet closed. If you have previously sent us the application form to join it and were chosen by the MLO team, you will receive a notification during the next couple of weeks. Almost all the functionality of the previous MLO version is already available in the Android beta. We also had something more to add, for example, improved automatic synchronization, dependencies between tasks, and one of the main improvements - import of all the custom views from the desktop to Android device, which makes MLO the most flexible task management app. And we are going to bring several new interesting functions while beta testing runs. As for the release of MyLifeOrganized for Android V2 - we will make it as soon as the testing stage will be finished. Thanks for being with us! Good to hear about the improvements to Android. I am still holding out for a web interface one day, when MLO would be a killer. We are considering about web version, but we haven't made the final decision yet. As soon as we do, we will make an announcement here. Thanks for being with us! Add a vote for a web version ! Will it offer local encryption? this is the big feature required for the Android version. Hi! We are considering about adding this functionality. Good news for beta testers. The first version of application is not useful at all. What is the estimated date of public release? Hello! The MyLifeOrganized team never announces certain release dates due to the complexity of the development process. We can only say that beta testing period usually takes several months to reveal and remove all the possible weaknesses. Is there any chance to be a beta tester? I suffer with the current version of application. I'm an IT-guy, work for large gamedev company. I can (and I'll do) provide a useful feedback. I can't wait already. Please add me to the beta testers! The views of main interface are not suitable for me in 1.6 version. I need custom views from windows version and I hope I can organize them in the main interface. I can't wait to use the new version of android. If could, could you add me to the testers' list?